Massage therapy license requirements vary from state to state and the regulations change over time. New York requires massage therapists complete 36 CE hours every three years for license renewal. 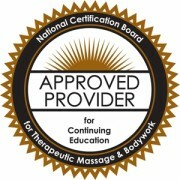 Adawehi Institute is approved by the National Certification Board for Therapeutic Massage & Bodywork (NCBTMB) as a continuing education Approved Provider and is also sponsored by NCBTMB to teach New York LMTs continuing education that is accepted by the State of New York for license renewal. If you have questions regarding your massage therapy continuing education requirements, we suggest contacting the New York Board of Massage directly. The telephone number for the New York Board is 518-474-3817 (extension 150) or visit their website at op.nysed.gov/prof/mt.